Not far from here, in Godshill Parish Church, is a medieval (c 1450) mural of a Lily crucifix, one of only two in Europe. Although the rest of the church is a joy to visit (and it has some very unusual lichens decking its outer walls too), there is something really special about gazing at that painting in wonder. For centuries after the Reformation it was hidden behind a coat of whitewash, to save it. It was only in 1842 that it was rediscovered, and visitors have been able to gaze as I do. 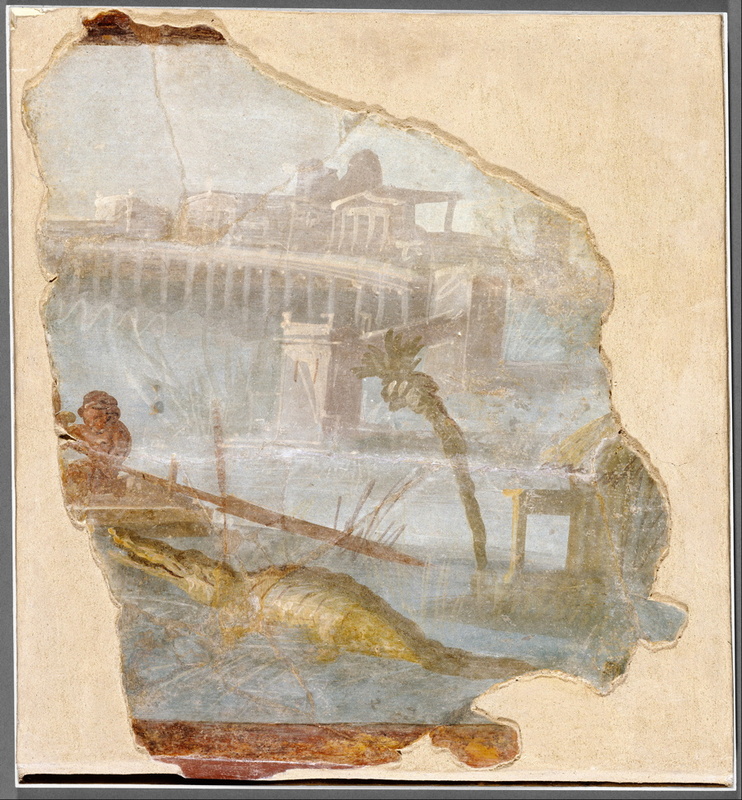 Anonymous, Nilotic Landscape (c 70 CE), fresco, 45.7 x 38 cm, Getty Villa, Los Angeles. Wikimedia Commons. This unique book takes us back not just a few centuries, but back as far as the Minoan Empire over 1500 years before Christ. It examines in scholarly detail evidence – and sadly that is often fragmentary, lost, or only literary – of the mural and panel paintings which were created from then through until the final collapse of the last remnants of the Roman Empire. I should point out at the outset that this is not a full-colour, glossy, hit-and-run account. If you want loads of colour images of the amazing murals in Etruscan tombs or in the ruins of Pompeii, or of Romano-Egyptian funerary portraits, there are other excellent books which offer those. Instead it provides the first detailed account of painting and its development in the Classical world for nearly a century. I ordered this book last autumn, and have waited impatiently for the last six months to see whether it will answer the many questions that I had about Classical painting. Look in even the vast art histories, and once you have skipped through pages about vases and statues, there is almost nothing about ‘proper’ paintings before the appearance of early Christian works. Yet books about perspective often assert that the Romans ‘discovered’ linear perspective, and there were many other issues that I wanted to clarify. It has been worth the wait, and the high price. The opening chapter (by Anne Chapin) covers the limited information remaining about paintings produced long before the Greek or Roman civilisations, by the Minoans on Cyprus and Crete including key sites at Knossos and Akrotiri, and by Cycladics and Myceneans. As with the rest of the book, many of the illustrations are in monochrome, and some are drawn copies of paintings which have sadly deteriorated or disappeared since their discovery. However the colour plates in the book, and additional images on the CD, provide a more vivid visual record. In addition to the revealed riches dating back before 1000 BC, I learned that early Mediterranean and Egyptian art colour-coded genders: males were given dark red skin, and females white or yellowish. Despite the collapse of these Aegean civilisations into a ‘dark age’ around 1000 BC, the case is made that these truly ancient paintings formed an important and influential foundation for the Greeks to follow. Chapter 2 (Jeffrey Hurwit) then takes us on to those early Greeks, up to about 500 BC. For this we have at last some literary evidence, from the likes of Pliny, which starts to put names to some of the most prominent artists. Sadly archaeological remains remain scant and fragmentary, and evidence has to be drawn from painted vases too. The appearance of polychromy is dated to the middle of the seventh century BC. However even the most basic accounts of painting at that time are speculative rather than grounded in evidence. Chapter 3 (Stephan Steingräber) starts coverage of the Etruscans, famed for having extensive murals in their tombs. These started in parallel with the first Greeks, with earliest painted tombs now dated to around 700 BC, and concluded soon after 300 BC. There is sufficient knowledge about styles and techniques to classify many of these into workshop groups, the antecedents of the workshops and studios which were to continue through the later history of painting. This chapter traces the development of techniques and detailed iconography, although the illustrations are limited in comparison to dedicated accounts of Etruscan tombs and their art. Chapter 4 (Mark Stansbury-O’Donnell) is something of a departure, in considering monumental Greek vase painting in an effort to gain more insight into mural and panel painting of the fourth and fifth centuries BC. We come across the first names of artists that many will recognise: Zeuxis and Parrhasios, and Pliny’s account of their painting contest. For the first time, paintings on vases start to provide lifelike representations of the 3D world, and ‘skiagraphia’ is formalised by Apollodorus around 400 BC. Although it is sad that this landmark must be shown in vase painting rather than murals, this is an important chapter. Chapter 5 (Stella Miller) completes the history of Hellenistic painting in the Eastern Mediterranean, to the middle of the first century BC. These consist of tomb paintings, symposia and funeral banquets, and a range of other topics, each of which is discussed thoroughly. Prominent among these are the Macedonian artist Philoxenos’ (or possibly Aristeides the Younger, according to latest opinion) astonishing Vergina hunt, on the ‘Tomb of Philip’ which may have been an early transfer from drawing to fresco. Sadly the images of a reconstruction of this painting in the book are so tiny as to be frustrating, and the only decent copies that I can find are at Triantafyllos Papazois’ website here. There is an excellent technical appendix. Chapter 6 (Agnès Rouveret) returns to tomb paintings in Italy, in the period 400 to 200 BC. Although this might appear to have been more appropriate after Chapter 3, it does actually fit in well here, following other Macedonian paintings. These show the development of portraiture, the depiction of shadows in early still life compositions of utilitarian objects, and the evolution of colour and tone/value: visible improvements in terms of representation and technique. Chapter 7 (JJ Pollitt) is more brief, and examines critical and other literature, in an effort to reconstruct information about techniques and aesthetics during the Classical period. Apelles and other less well-known artists make their first appearance here, in critical analyses of Pliny and others. Chapter 8 (Irene Bragantini) reaches what for many readers will be the high point of the book, Roman painting during the Republic and early part of the Empire. Major sites here include the Villa at Boscoreale, the Villa of the Mysteries, the House of Augustus, and the Villa of the Farnesina, which are discussed in turn, as are Herculaneum and Pompeii more generally. Additional material is really essential here to appreciate the remarkable paintings which have been found. The final chapter (by Roger Ling) concentrates on the middle and late Roman Empire, up to the fourth century CE. This bring further developments in techniques and style to a level of realism which is comparable to that of the early Southern Renaissance. However the rise of secco and tempera in wall painting, and political issues over the payment of painters have been held responsible for declining standards. 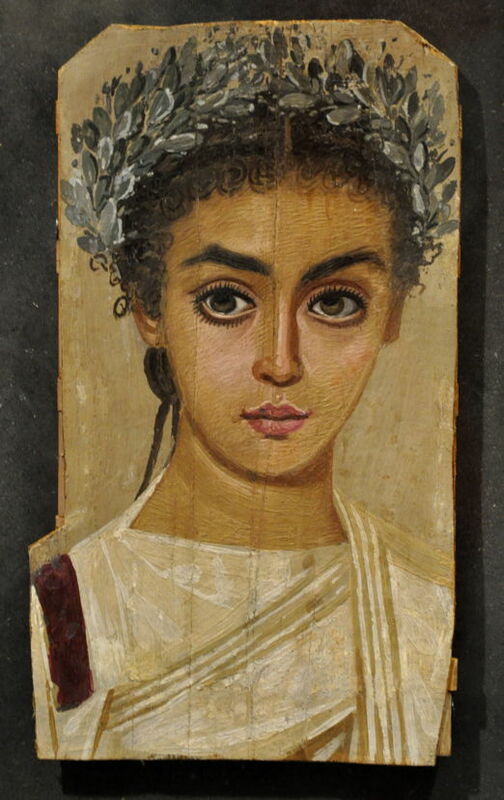 There is limited material on the Romano-Egyptian funerary portraits (covered in Favourite Paintings 12 here). The appearance of the first paintings bearing overtly Christian themes in around 220 CE provides a suitable link to later history. There is a huge list of references to scholarly work in nearly 40 pages, a useful short glossary of terms used in the Classical world (which helped me distinguish prothesis from prosthesis, for instance), and a thorough index. If books were weighed by parentheses and endnotes, this volume would be too heavy to lift. However it has enabled a clear answer to my original question about linear perspective being used by Roman painters: yes it was, but only in local areas within a painting. This results in curious effects which are certainly more true to life than much later paintings prior to Brunelleschi’s discovery in the early fifteenth century, but the Romans stopped short of anticipating his more integrated approach to perspective in drawing and painting. I cannot recommend this book too highly for anyone who wants to understand the earliest phases in the history of painting. It is expensive, and you may have to seek a copy out through a library. But I doubt whether I will see anything to compare with it in my lifetime, and it is a work that I will keep returning to. I will see what I can select for a future Favourite Painting, perhaps. Posted in General, Painting and tagged book, Etruscan, Greek, history of painting, Minoan, painting, Pollitt, review, Roman. Bookmark the permalink.